Two individuals voluntarily provided original information to the Unites States Securities and Exchange Commission that led to a successful enforcement action in the same SEC whistleblower case. The SEC’s Claims Review Staff (“CRS”) recommended that the Commission grant them the maximum SEC whistleblower award possible. 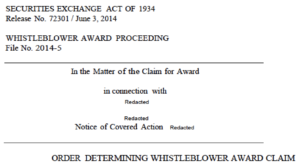 The maximum SEC whistleblower award available for a single case is 30% of what the SEC collects from the wrongdoers. In the CRS’s Preliminary Determination, it recommended that the the total overall 30% award be split evenly, with the two whistleblowers receiving individual SEC whistleblower awards of fifteen percent (15%) each. The two whistleblowers informed the SEC that they would not contest the CRS’s determination. The Commission entered an Order granting the joint maximum SEC whistleblower award as recommended by its Claims Review Staff. The Order explained that the two individuals had been “acting in concert” as SEC whistleblowers. For the reasons set forth by the Claims Review Staff, the Commission ordered that the two whistleblowers “each shall receive an award of fifteen percent (15%) for a total of thirty percent (30%) of the monetary sanctions collected” from the perpetrator(s) of the securities fraud(s) or violation(s). These whistleblowers provided original information and assistance that enabled us to investigate and bring a successful enforcement action in a complex area of the securities market. According to the press release, the total 30% SEC whistleblower reward came to more than $875,000, split evenly between the two whistleblowers. The Chief of the OWB also complimented SEC whistleblowers in the press release. “Whistleblowers who report their concerns to the SEC perform a great service to investors and help us to combat fraud,” he said.